One of the goals people aspire is to live very long satisfying lives. We need our bodies to be in good working conditions to achieve this. In theory, our bodies are designed to live for a very long period of time. How much? Here lies the questions: What is aging? How do we prevent it or slowing down? It is not a matter of an elixir or potion, but a confluence of factors determining each one of our individual potentials in life. Genes, diet, physical and mental activity, environment and exposure to toxins, activities we engage in. All of these and maybe more play a role in longevity. The human body is truly awesome. It is composed of many cells with many different functions, yet they all share the same DNA. When there is damage to the cells, the body repairs the damage by eliminating the offending agent (infections, toxins, etc) restoring affected cells, replacing the damaged cells or “plugging the hole” with scar tissue. The path taken depends on the extent of the damage initially sustained. Our bodies have cells that neutralized foreign organisms (white blood cells) and others that neutralized or eliminate toxins (kidneys, liver). The way some of these cells achieve this create a response called inflammation. Inflammation is part of the complex biological response of body tissues to harmful stimuli, such as pathogens, damaged cells, or irritants, and is a protective response involving immune cells, blood vessels, and molecular mediators. The function of inflammation is to eliminate the initial cause of cell injury, clear out dead or dying cells and tissues damaged from the original insult and the inflammatory process (collateral damage), and to initiate tissue repair. Cells are repaired by “cloning” a living cell. The cells divide and produce an identical copy to replace the cell damaged. Picture this: when you get a copy of a document using the best copy machine available, it probably is difficult to tell them apart. But what if you make a copy of a copy, and then a copy of the second copy and keep doing it one thousand times. Copy 1000 won’t look identical to the original. The copy quality degraded. 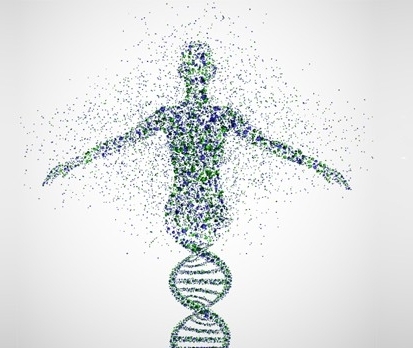 Your body cells have the genetic material (DNA) coiled in the nucleus as chromosomes. Cells must uncoiled each one of our 46 chromosomes and make and identical copy. If we were able to untangle all chromosomes and attach them together we would get a DNA strand that is about 6 feet long! The copying process then takes place, the DNA is coiled again and the cell divides. This process then begs the question: if the new cell is identical to the original, why do we age? Our bodies replace about 300,000,000 cells a minute! Picture this: uncoiling the chromosome, copying 6 feet long of DNA into an identical chain and recoiling it into the new chromosomes times three hundred million times a minute! During cell division, it is essential that DNA remains intact and evenly distributed among cells. Still, mistakes do occur on rare occasions, producing changes in the DNA. This changes are called mutations. The mutations can take place in areas where they are not expressed in the body, but sometimes they happen in critical areas, leading to diseases such as genetic diseases, cancer, etc. What can we do to avoid this potential mistakes? Decreasing the need to replace cells! Here are few strategies from medical studies which have shown progress in slowing down the degeneration (aging) of our bodies. Inflammation causes significant collateral damage to cells in the area, leading to a need to replace many cells that otherwise would be healthy. If the inflammation levels are high and it is widespread, then aging process is accelerated. Sleep: allow your body rest to repair. Other studies link sleep deprivation with decreased muscle endurance and increased levels of perceived exertion and decreased reaction time. There is increasing evidence that toxins accumulate in the brain during the day, but are eliminated during sleep, allowing the removal of inflammatory agents. When this happens, our ability to think is enhanced. Lack of sleep is associated with poor judgment as well. Aim to sleep enough so you feel refreshed and energized the next day. Diet: don’t do damage with a fork! The obesity epidemic with a higher rate of degenerative diseases has prompted multiple studies. In a number of species, including yeast, fish, rodents and dogs, calorie restriction without limiting essential nutrients to avoid malnutrition, has been shown to slow the aging process resulting in longer maintenance of youthful health and an increase in longevity. However, low body mass indexes are associated with increased risk for death. Dash Diet, Mediterranean Diet and the Mind Diet (which is the combination of the previous two). Avoid eating: five unhealthy groups: red meats, butter and stick margarine, cheeses, pastries and sweets, and fried or fast food. Basically avoid processed starches and fats, particularly when combined. Medical Studies have shown that exercising for about 150 minutes a week with a heart rate at 70% of maximum (about 220-your age) is associated with improved outcomes and longevity. Studies have shown that just 90 minutes a week is effective in improving outcomes as well. Over exercising is associated with injuries, so it is best to start low and increase slowly the rate of exercising. Endurance: walking, cycling, dancing, yard work, etc. Balance: helps to prevent falls, a common problem in older adults. Many lower-body strength exercises also will improve your balance. Standing on one foot, Heel-to-toe walk, Tai Chi, Yoga. Flexibility: can help your body stay limber. Being flexible gives you more freedom of movement for other exercises as well as for your everyday activities. Shoulder and upper arm stretch, calf stretch, Yoga. When not exercising your muscles weaken and can lose mass and strength (atrophy). This process also make it easy to sustain injuries. If possible consider alternative ways to commute to work or do physically active activities after work. You will notice how rested you feel after exercising. Avoiding injury that would trigger severe inflammation seems like a given. Unfortunately we engage in behaviors that cause significant harm and in many cases may lead to disease and/or death. Tobacco Use: In the 1930-1950’s about 75% of the population smoked tobacco. Multiple different studies have shown the severe damage caused by tobacco use in many different parts of the body: respiratory, circulatory systems, bladder, brain, etc. Simply do not start smoking. It will significantly cause disability and limit your lifespan. Alcohol: in excess will cause severe disease and even death. The World Health Organization recommends that men have no more of 4 drinks in a 24 hour period or 14 drinks in one week, whichever is less. For Women, the safe limit is 3 drinks in a 24 hour period or 12 in one week. Recent studies have shown that the 14-21 drinks a week significantly increase the risk for cognitive impairment. Alcohol has also been shown to increase the risk for cancer. Other external sources of injury: psychotropic substances cause harm by creating physical and/or psychological dependence and inflammatory responses locally. For example we see nasal septum perforation associated with cocaine use, etc. Try to balance your life and avoid excesses. A proper diet, physical activity, and engagement in activities that bring you joy will minimize inflammation and slow down the aging process. Make a provision for enough recovery time and high quality sleep time. Medications for chronic diseases can help you restore the balance if recommended by your physician, but they in themselves will not give you all the benefits explained above. Take charge of your health and use all of the recommendations to allow you to experience a long and fulfilling life! Dr. Prieto attended the Universidad Central de Venezuela and completed his residency in Internal Medicine at the University of Connecticut Health Center, Farmington. Prior to joining Emerald Physicians, he practiced medicine with Medical Affiliates of Cape Cod. He is certified by the American Board of Internal Medicine, and a member of Cape Cod Preferred Physicians. Dr. Prieto’s special interests include geriatrics, diabetes, and hypertension. Dr. Prieto sees patients at our Bourne office, located at 1 Trowbridge Road.